Certified Banker (CB) is a professional qualification developed and offered by the HKIB to help banking practitioners at all levels raise their professional standards with skills relevant for the fast-changing banking environment. It also provides a common qualification benchmark that is recognised by regulators and leading authorised institutions. The CB programme is the enhancement and replacement of the Associate of The Hong Kong Institute of Bankers (AHKIBTM) qualification, which was launched over two decades ago. The programmes of CB encompasses both generic and specialist topics. It also integrates the programmes developed by the Hong Kong Monetary Authority's Enhanced Competency Framework (ECF). The ECF programmes, which are the building blocks of CB are administered by the HKIB. 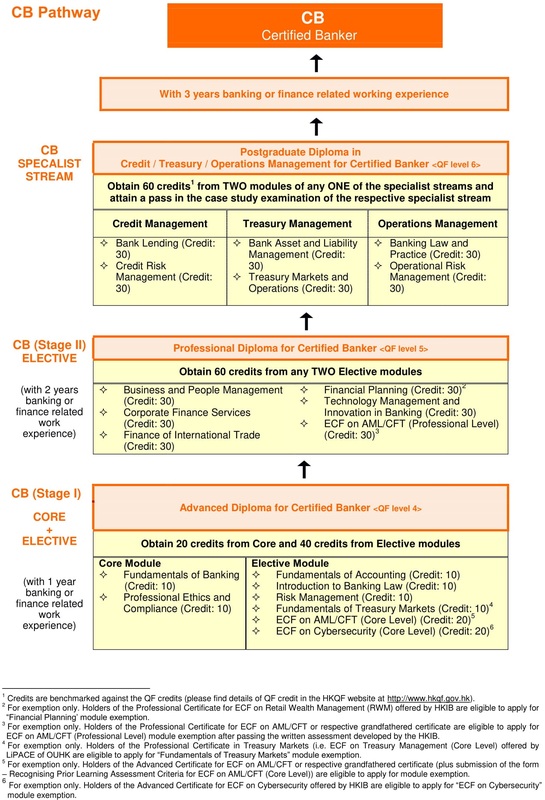 Certified Banker contains three programmes in progressive QF Levels (i.e. Advanced Diploma, Professional Diploma and Postgraduate Diploma). Candidates should attempt the programmes progressively according to their academic background and related work experience. All three programmes have been quality assured by the Hong Kong Council for Accreditation of Academic and Vocational Qualifications (HKCAAVQ) and are recognised under the Qualifications Framework (QF) as Specification of Competency Standards (SCS) based programmes. Their learning contents are encompassing all relevant Units of Competency (UoCs) drawn from the SCS of banking industry. The Postgraduate Diploma for Certified Banker is the first and only Specification of Competency Standards (SCS) based banking qualification which is accredited at QF Level 6 in Hong Kong. This is at the same level as a Master’s degree. Please read the Accreditation to understand more. Certified Banker is already recognised in regions outside Hong Kong and is set to achieve even wider global recognition in the years ahead. Certified Banker offers qualification in three levels, reflecting the different level of experience and skills of an individual. The CB is suitable for current banking and financial practitioners who wish to deepen industry knowledge for career advancement as well as post-secondary full time students who wish to join the banking profession after graduation. Individual Members who have completed a particular level and acquired the relevant years of banking or finance related work experience will be entitled to use the respective CB designations. Two years of banking and finance work experience with a recommendation from employer. Remark: Full time students of the stated Diploma or Degree programmes will also be considered. Mature applicants with at least ten years of banking and finance work experience. Remark: Applicants who do not possess a pass in “Professional Ethics and Compliance” or module(s) of the same nature at HKIB are required to first sign up for the training and obtain a pass in the corresponding examination at HKIB.